Have you heard of RawSpiceBar? They are a spice box subscription that sends out 3 freshly grounded flavor kits every month. We first introduced them on our blog back in 2015 when they were still a new subscription company. We thought their idea was neat and were eager to try out some of their spices. The 3 different spices and recipes we got to try in 2015 were wonderful and as food lovers we enjoyed every dish created with them. So, when RawSpiceBar reached out to us not too long ago and asked if we would like to try some of their new spice flavor kits, our answer was of course yes! In this post, we will share about the 6 different bags of flavor kits we got and the recipes we decided to test them with. A few things have changed with RawSpiceBar since we last wrote about them. Most notably is their spice packaging. Gone are the days of the brown bags, they have instead been replaced by these colorful ones. We never minded the brown bags and we don't mind these either. As long as the spices are good, that is really all that matters. One of the other notable changes is actually on RawSpiceBar's website. There is now a recipe section with a ton of different recipes for their flavor kits. This is great because it gives you a variety of dishes to choose from, instead of just the recipes that came within the subscription box. We also noticed that the spice amount per pouch have changed too. Each bag of spice mix used to contain .4 oz of spice and now it is only .3 oz. In numbers, that might not look like a lot, however, for spices that is quite a bit. Anyways, this review of ours is actually pretty late but better late than never right? We wanted to test out each spice kit with at least one or two recipes (whether they be from RawSpiceBar or not) before we shared our review on them. That process took longer than expected, so the review was delayed. However, here they are so let's get right to it. The Indo-French Vadouvan spice kit is a French take on the Indian masala. This kit is bursting with aromatic flavors. It contains fenurgreek, fennel, cayenne, aleppo pepper, cumin, cloves, green cardamom, turmeric, coriander, brown mustard seeds, and other spices. Together, they create a well rounded flavor that's balanced by the nuttyness of sesame seeds. This Indo-French Vadouvan spice kit can be used in a variety of ways such as a base for curry or as a tempering spice at the end of cooking. Once in a while, when we have a not-so-busy weekend, we would make brunch. Us mother-daughter pair would cook together and enjoy some free time with yummy food and some yummy mimosa. We generally make quite a few dishes even though there's only a few of us. Having a variety to choose from is always nice even if we know we like every dish we make. Most of our brunch dishes have an Asian twist to them but we always like to try a new recipe during this time as well. 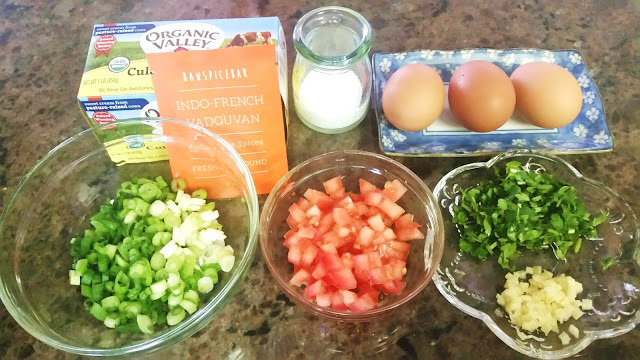 That weekend, we tried out the Vadouvan Scrambled Eggs with this Indo-French Vadouvan spice kit. 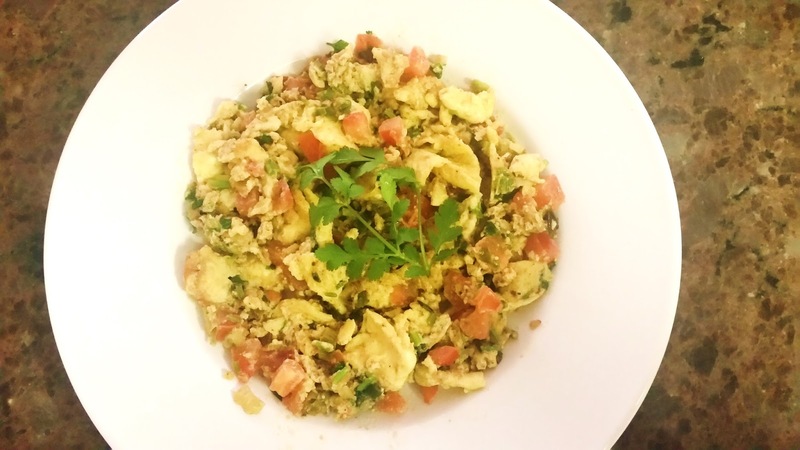 The Vadouvan Scrambled Eggs recipe is super easy to make. The ingredients were already in our fridge and honestly you can substitute some of them too. For example, we made this scrambled eggs with red bell peppers the other day instead of tomatoes and it still turned out really good. If you do decide the follow the recipe to the dot, the end result as seen in the picture above is pretty yummy too. It's a unique way to spice up the normal scrambled eggs. Oh, and we did cut the recipe by half since the original recipe calls for 6 eggs and that would have been way too much for us. Our first Spice box had a pumpkin pie spice kit in it, so it's neat to see another this time around. Although this is called the Unpumpkin Pie Spice, it is pretty similar to the pumpkin pie spice we first received. This blend is great for fall inspired pumpkin recipes. It's versatile and can be used in a variety of recipes from traditional baked goods to latte, ice cream, roasted squash and more! The spice kit has a blend of allspice, cinnamon, ginger, nutmeg, star anise, and other spices. As a throw back, we made the pumpkin spice Dabo Kolo, which is an Ethipian recipe for pumpkin spice ricotta donuts holes. We also tried the Pumpkin Spice Maple Muffins recipe and it was great for breakfast! The Peppercorn Chai is a blend of cinnamon, cloves, green cardamom, toasted black peppercorn, nutmeg, star anise, and other spices. Chai spices are a staple in Punjab Cuisine and it generally served in a hot milk tea form following a meal. We tested the Peppercorn Chai Spice Tea recipe and both of us agreed that it is so-so. Chai tea is generally a hit or miss with us depending on the blend and this one kind of fell in the middle. One of us like it better than the other and we are sure you can guess which. Anyways, we also tried the Chocolate Banana Chai Muffins, which were a much bigger hit than the tea. We did not add as much chai spice as the recipe suggests (we added 1 tsp instead of 2) because we only wanted a hint of the flavor without it overpowering everything else. In retrospect, 1.5 tsp of chai spice might have been better. Still, the muffins were delicious and we will be making them again. We dug into this bag of spices before we took the pictures, oops. We were actually making chicken the day these spices came in, so instead of our original recipe, we decided to try this one out. We already had all the ingredients needed anyways, so might as well. This is another simple recipe and you can generally find all the ingredients in your pantry or fridge. The Schnitzel Spice Kit is a blend of juniper berries, cayenne peppers, bay leaves, black peppercorn, and other spices. 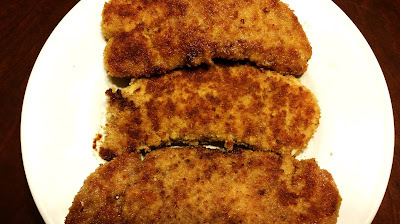 With the Schnitzel Spice Kit we made the Chicken Schnitzel. Again, we cut down the recipe and made 3 instead of 4 pieces of chicken. It is an easy recipe to adjust so if you need a smaller or bigger serving size, just adjust accordingly. Okay, we know, this is not the prettiest picture but the chicken was good and that's all that matters. It was great to try a different chicken recipe, variety is what makes life fun after all. However, we probably won't make this recipe too often. Even though it was good, it didn't wow us or anything and it's not a dish that we'll crave for a lot. It'll probably be a once in a blue moon kind of recipe. The Caraway, Fennel, and Anise Bread spice kit contains a blend of caraway seeds, fennel seeds, star anise, coriander, and other spices. This spice kit was one of the odd one out for us and it was one of the reasons why the review is late. It's a bread spice and we don't really make bread in this family (unless it is banana bread), so we had no idea what to cook it with. There is also a pretzel recipe for this spice kit too and as expected, we don't really make pretzels either. We tried to find none bread or pretzel recipes to test this spice kit out. However, not having any luck with that we came back to the pretzels. We love soft pretzels, especially at the movie theaters so we were looking forward to these. We did cut the recipe in half because we didn't want to make too much and not like it. The original recipe makes 8 pretzels, so by cutting it down we made 4. The pretzels turned out pretty good in our opinions. Better than the ones we get at the movies for sure. The recipe was easy to follow and it is a pretty easy recipe over all. Alright, last but certainly not least, the Horseradish & Mustard Seeds kit. This kit is a simple blend of horseradish seeds, brown mustard seeds (toasted), and yellow mustard seeds (toasted). It can be used in a variety of recipes but we went the simple route and tried the Mustard Braised Cabbage recipe. This recipe is perfect for a busy night. It only needs a few ingredients and takes about 20 minutes to make. We can see ourselves making this on a lazy night, or really any night for that matter. If you make bento boxes like we do, you can easily make this as a side too! Final Thoughts: Overall, these 6 bags of spice kits were a great selection and allowed us to try a variety of recipes both old and new. Not every bag of spices were our favorite, but that doesn't mean the overall experience wasn't worth well. The RawSpiceBar subscription is great for people who love to cook and love to try a variety of recipes. If that's you, than do check them out! Use code RAKFLAVOR: for $5 off your first subscription or any 6 or 12 months gift order.